The birth certificate issue] is simply a distraction from the more critical issues that are facing the country. . . . And so I had my health director, who is a physician by background, go personally view the birth certificate in the birth records of the Department of Health. . . . The president was in fact born at Kapi’olani Hospital in Honolulu, Hawaii. And that’s just a fact. And yet people continue to call up and email and want to make it an issue. And I think it’s, again, a horrible distraction for the country by those people who continue this. . . .It’s been established he was born here. . . . I can understand why people want to make certain that the constitutional requirement of being a, you know, natural born American citizen … but the question has been asked and answered. And I think just we should all move on now. Rightardia updated this article on Jan. 27, 2011. The Veteran's Administration (VA) is not your friend. I have heard this echoed by people within and associated with the VA. The VA is actually a self licking bureaucracy that makes work for itself. If the VA were to provide more objective disability ratings earlier in the claims process, the number of appeals would be substantially reduced. Because the VA institutionally low balls veterans, the veteran is forced into a circular appeals process that takes four to 10 years or longer. Rightardia is not and has never been an anti-government site. We think that the average American can expect more assistance form the government than they can from private enterprise. But we We feel obligated to advise other veterans that VA criticism is well-deserved. The VA has corrupted the rating process and has been institutionally disregarding a precedent rulings from the Court of Appeals for Veteran's Claims (USCAVC). If the VA were to rate a Veteran for hypothyroidism, the rating officer would start at the bottom of the rating scale and work up in a lock-step fashion. f the vet had bradycardia, an irregular heart beat and other cardiac conditions due to the hypothyroidism and sleep problems related to sleep apnea and insomnia, the VA would ignore these 'criteria" and render a 10 per cent rating. The VA likes to award the 10 per cent and 0 per cent ratings. In both cases, the Vet is now eligible for services at veteran's hospitals and clinics. He or she can also get service-connected medications for the specific condition. Fatigability, require continuous medication, be constipated, have mental sluggishness, muscular weakness, mental disturbance, weight gain, cold intolerance, muscular weakness, cardiovascular involvement, mental disturbance (dementia, slowing of thought, depression), bradycardia (less than 60 beats per minute), and sleepiness. This is why only 8.4 per cent of veterans are 100 per cent disabled. Although the VA rates this way, the Court of of Appeals for Veteran's Claims (USCAVC), has stated the VA is not following the law. A three judge panel released a precedent setting ruling that the VA is ignoring: See UNITED STATES COURT OF APPEALS FOR VETERANS CLAIMS, NO . 07-2728, DIANNE C. TATUM , APPELLANT , (Argued July 15, 2009 Decided September 28, 2009). Any veteran, who is writing a Notice of Disagreement or who has appealed to Board of Veteran Appeals (BVA) or the USCAVC, needs to be familiar with this ruling or rulings more closely related to their particular disability. The BVA agreed with Ms. Tatum entitlement to a higher disability rating because it found that she that the constipation example was irrelevant and that a 30% disability rating was permitted only if all three symptoms were present. "Where there is a question as to which of two evaluations shall be applied, the higher evaluation will be assigned if the disability picture more nearly approximates the criteria required for that rating." The VA Secretary disputed this argument. The USCAVC considers the laundry lists in the 38 CFR to be examples rather than criteria. In addition, the higher level examples are inclusive of the lower disability rating examples. Republicans have long seen themselves as synonymous with America, and everyone else as deviant and marginal. SI Hayakawa talked about this when he was in the US Senate. Republicans have often believed they own America. Conservatives want a country in which workers live in company towns, shop in the company store or Wal-Mart and go to church every Sunday. In other words, they want to put Americans in a box they created. If you want a life outside of that box, you must be a deviant or need to be marginalized. This is why blacks, Hispanics, artists, writers, agnostics, atheists, gays, the handicapped and union workers will always rub Republicans the wrong way. Anybody who is 'out-of-the-box' will not be appreciated by Republicans. Obama Is “Un-American” to Be So Mean to B.P.? That's what Rand Paul thinks. Never mind that most of the health care industry attacked the Obama administration with more than a 1000 health care lobbyists. Never mind the corporations that own the Republican Party. Never mind that Fox News reads press releases from corporate boardrooms verbatim. And what about all of those corporate lies about death panels, that health insurance would cost more and Americans would lose their family doctors? Rand Paul has only existed for like two weeks, and already, there have been so many amateur missteps. 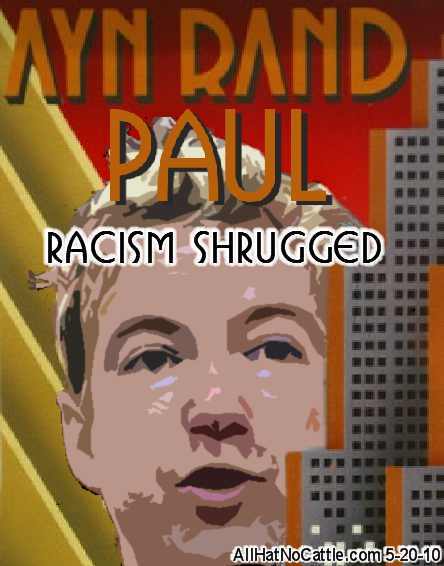 Rand attacked the Civil Rights Act, the Kentucky Republican senatorial candidate went on Good Morning America today to discuss how “un-American” this President Obama was for blaming B.P. for the oil spill. Accidents happen! Doesn't it say that in in the Constitution? Rand Paul wants you to feel sorry for a poor little multi-national corporation. What Paul doesn't mention is that each week the spill continues, it is the equivalent of the Exxon Valdez spill which polluted an entire bay in Alaska. The reason this accident happened is because the oil industry corrupted the Minerals Management Service who gave BP safety waivers on drilling in the Gulf. Rand Paul seems to be ill-equipped to represent his constituents in Kentucky. Libertarians are not that different from other conservatives. Most want to abolish the IRS, reign in the military for purely national defense work and close some other cabinet level offices. Only two per cent of Americans call themselves libertarians. Rightardia has always looked at libertarians as ideologues who have never had any impact on US politics. Tonight, the Committee on House Administration passed the DISCLOSE Act (HR 5175) out of Committee. The bipartisan bill introduced by Reps. Chris Van Hollen (D-MD), Mike Castle (R-DE), Walter Jones (R-NC), and Robert Brady (D-PA) responds to the Supreme Court’s ruling in Citizens United v. FEC. That unpopular ruling overturned the ban on corporate contributions under the McCain-Feingold Act to political campaigns by increasing transparency and disclosure of political spending, and preventing foreign companies from influencing America’s elections. It will also ensure that entities that receive taxpayer money can’t turn around and spend money in elections. Today the House of Representatives made critical progress on The DISCLOSE Act, to protect our elections from being overtaken by special interest money and influence. The recent Supreme Court decision in the Citizens United case opened the floodgates for the corporate takeover of elections. With this legislation, Congress has acted to help ensure that the special interests do not drown out the voices of America’s voters. This legislation restores transparency and accountability to our campaigns, and ensures that Americans know who is really behind political advertisements. This bill requires corporations to stand by their ads in the same way candidates do, and prevents foreign-owned entities from participating in our elections. It prevents the use of taxpayer dollars to sway elections, and sets high standards for financial disclosure by outside groups seeking to influence our democratic process. In short, this legislation reaffirms a fundamental American value: the people decide our elections, not the special interests. I look forward to bringing this bill to the House floor soon. Today, the House Administration Committee took another important step toward putting in place critical protections to control the flood of special interest money into American elections. The DISCLOSE Act, now moving to debate on the floor of the House of Representatives, would establish the toughest-ever disclosure requirements for election-related spending by big oil corporations, Wall Street and other special interests. It would prohibit foreign entities from manipulating the outcome of U.S. elections, and it would shine an unprecedented light on corporate spending in political campaigns so that the American people can clearly see who is trying to influence campaigns for public office. These changes are particularly urgent in the aftermath of the Supreme Court’s Citizens United decision, and I encourage the full Congress to give this strong, bipartisan legislation the swift consideration it deserves. Posted in What's Happening, Draining the Swamp, Oversight. Prodded by national anger at Wall Street, the Senate passed the most far-reaching restraints on big banks since the Great Depression. In its broad sweep, the massive bill would touch Wall Street CEOs and first-time home buyers, high-flying traders and small town lenders. The 59-39 vote represents an important achievement for President Barack Obama, and comes just two months after his health care overhaul became law. The bill must now be reconciled with a House version that passed in December. The legislation Should reach Obama's desk before the Fourth of July. The legislation aims to prevent another meltdown of big Wall Street investment banks and the resulting costly bailouts. It calls for new ways to watch for risks in the financial system and makes it easier to liquidate large failing financial firms. It also writes new rules for complex securities blamed for helping precipitate the 2008 economic crisis. It ALSO creates a new consumer protection agency, something republicans had little enthusiasm for. It would impose new restraints on the largest, most interconnected banks. It would demand proof that borrowers could pay for the simplest of mortgages. "Our goal is not to punish the banks but to protect the larger economy and the American people from the kind of upheavals that we've seen in the past few years," Obama said earlier Thursday after the Senate cleared a key 60-vote hurdle blocking final action. Obama said, the fiancial industry had tried to stop the new regulations "with hordes of lobbyists and millions of dollars in ads." "The decisions we've made will have an impact on the lives of Americans for decades to come," said Sen. Richard Shelby, R-Ala., who voted against the legislation. "Judgment will not be rendered by self-congratulatory press releases, but, rather, by the marketplace. And the marketplace does not give credit for good intentions." Democrats argued the bill was a potent response to the financial abuses, regulatory weaknesses and consumer misjudgments that plunged the nation deep into recession. "To Wall Street, it says: No longer can you recklessly gamble away other people's money," said Senate Majority Leader Harry Reid, D-Nev. "It says the days of too big to fail are behind us. It says to those who game the system: The game is over." As House and Senate negotiators meet to work out differences in the bills, the common ground between the two bills will likely tilt toward making the bill tougher on banks rather than weaker. 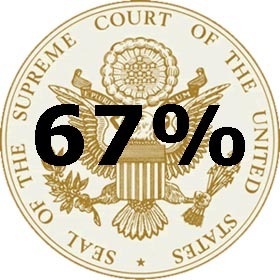 Tow thirds of of likely voters disapprove of the US Supreme Count, with 31% giving a positive rating and 2% were unsure. This survey, was conducted by Zogby International May 14 through May 17, 2010, had a sample size of 2,063. A sampling of Zogby International's online panel, which is representative of the adult population of the U.S., was invited to participate. Slight weights were added to region, party, age, race, religion, gender and education to more accurately reflect the population. The margin of error is +/- 2.2 percentage points. HONOLULU - It's law in Hawaii that the government can ignore repetitive requests for President Barack Obama's birth certificate. Republican Gov. 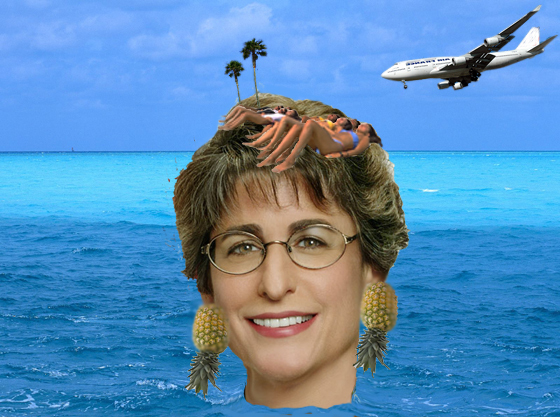 Linda Lingle signed into law Wednesday a bill allowing state government agencies to ignore follow-up requests for information if they determine that the subsequent request is duplicative or substantially similar to a previous request. The law is aimed at so-called "birthers ." Conservatives cannot seem to deal with past defeats. The Civil Rights Act of 1964 was a bare bones law that prevented Southern states from repressing Black voters. When Lyndon Johnson signed the act into law, most Dixiecrat democrats became Republicans. This law was the right thing to do, but it had a bad effect on the Democratic Party and led to the 1970s Reagan 'revolution.' Rand Paul appear to be another sappy conservative who is out of touch with US history. Every week the Gulf oil spill puts out as much oil as the Exxon Valdez did during the oil spill at Prince William Sound, Alaska, on March 24, 1989. C'mon, America. What is wrong with the gulf of Mexico filled with oil? Once you go Black, you never go back (Jimmy Kimmel)! At the height of the Cold War, one man's decision may have saved the world from annihilation. Most historians point to the Cuban missile crisis of 1962 as being the closest the world came to all-out nuclear war. The Major had been working with his Republican congressman to get some issues with a VA calim resolved. After four congressional inquiries, The Major was not too impressed. Sam Gibbons Federal Courthouse in Tampa. She will transmit some of the major's documents to Senator Nelson's VA staffer who is in Orlando. 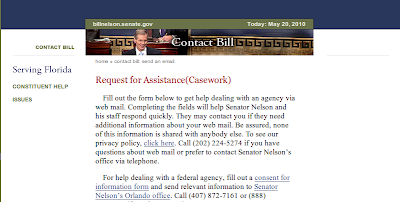 Senator Nelson’s office can help if you have a problem dealing with a federal agency, including, but not limited to Medicare, Social Security, veterans’ benefits and travel visas. To effectively and efficiently work on your request, complete and sign the consent for release of information form, provide a detailed account of the problem and describe any actions already taken. Include copies of all documentation that support your claim or may be helpful, such as letters to and from agencies as well as medical or other forms. The consent form can be completed online. Mail or fax all materials to Senator Nelson’s Orlando office. If your problem is life-threatening, call (407) 872-7161 or (888) 671-4091 or fax a completed consent form to 407-872-7165 during business hours (Monday-Friday; 8:00am-5:00pm). Call (888) 671-4091 which is toll free if you have any questions. Bill Nelson is one of the few people who have served in both the House and the Senate as an astronaut. Rightardia attended the Florida State Democratic Convention in Orlando and got to hear Senator Nelson speak on the Obama health care plan which is now law. The Rightardia staff was impressed. 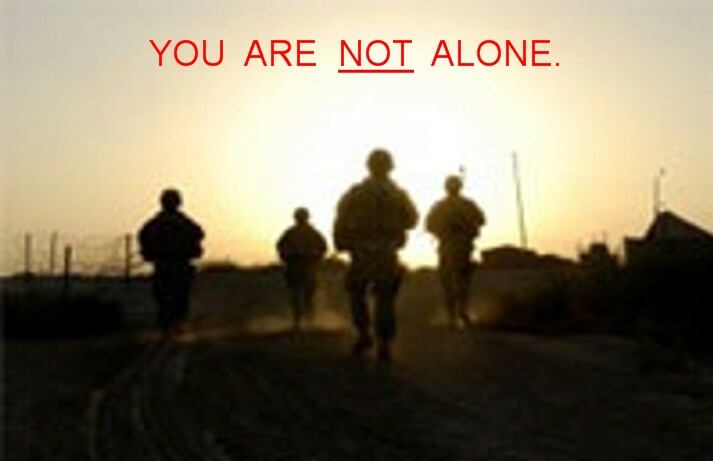 An open letter to Eric Shinseki 7th United States Secretary of Veterans Affairs. 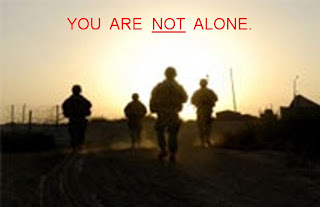 I have been involved with a VA disability claims since I retired from the Air Force in 1990. I would like to make some observations on how the clams process can be streamlined from a veteran's perspective. The C-file is bogging the entire system down. After prevailing in a BVA appeal, my claim was split between the AMC and Bay Pines VARO. While the AMC spent a year working on my claims, the Bay Pines VARO was unable to work on their part of the claim until my C-file was returned from Washington. Since the C-file has not been turned into electronic records, the single paper C-file can add years to the claim process. The VA needs an integrated database. When My Disabled American Veteran (DAV) representative looks at my claims status, he has to go into 5 different electronic systems. If I call different organizations in Washington or at Bay Pines about my claims, I get different very different answers from the VA representative on my claims' status. Both VA and veteran representatives frequently move and this creates an institutional knowledge gap. I am on my fifth DAV service officer and my third Bay Pines VARO claims officer in the past year. Transfers need to be slowed down to improve service and to maintain institutional knowledge. For example if a veteran has been rated 10 per cent disabled for 7903, Hypothyroidism and the BVA believes the rating is too low, The BVA should have the authority to raise it to the next level that is 30 per cent in the 7903 example. The BVA could offer the veteran the next higher rating or the option to remand the appeal for a rating higher than the 30 per cent level . Many veterans would accept the next higher rating. This would avoid another year or more of paperwork that a remand at this time requires. This could reduced the remand load on both he AMC and the VAROs. The AMC and VAROS are ignoring Appeals Court guidance on disability ratings. Symptoms listed in the rating criteria are simply examples of the type and degree of the symptoms, or their effects, that would justify a particular rating; analysis should not be limited solely to whether the claimant has the symptoms of all of the examples of a particular rating level. These examples are not rating criteria and the VA Appeals Court has repeatedly stated the Veteran does not have to meet all of the examples to be rated at a particular rating level. In fact, the higher levels are inclusive of the lower levels (Mauerhan v. Principi, 16 Vet. App. 436, 442 (2002) and DIANNE C. TATUM, APPELLANT). This suggests the AMC and VAROS are starting at the bottom of the 38 CFR, Part C rating examples and then moving from the bottom of the scale upwards and ignoring the higher level indicators of a condition as well as the medical evidence that the veteran is providing (see UNITED STATES COURT OF APPEALS FOR VETERANS CLAIMS NO . 07-2728.This is an institutional problem that is allowing the VA to low ball veteran's claims. If the VA wants to be a true advocate for the veteran, the claims officers should start at the 100 per cent level to see if the higher level indicators exist. If not, the rater should move to the next lower level. In the hypothyroidism example, the rating officer would move from the 100 per cent level to the 60 per cent level. The rating process would be more equitable if this process were used and the number of appeals would be reduced in the VA. It is my express hope that these observations will be useful to the VA. It is clear during the Bush administration that the VA system is broken and I know that you and President Obama are working hard to improve the Veterans Administration. Florida has not prospered under 12 years of GOP rule. Florida now has one of the highest employment rates in the nation and the Republicans in the statehouse nearly destroyed the public school system in the state. Now a conservative nitwit with no political experience is running for governor. Scott has a very checkered past in the health care industry. Numerous New York Times stories, beginning in 1996, began scrutinizing Columbia/HCA's business and Medicare billing practices. These culminated in the company being raided by Federal agents searching for documents and eventually the ousting of Scott by his fellow board directors. Among the crimes uncovered were doctors being offered financial incentives to bring in patients, falsifying diagnostic codes to increase reimbursements from Medicare and other government programs, and billing the government for unnecessary lab tests, though Scott personally was never charged with any wrongdoing. HCA wound up pleading guilty to more than a dozen criminal and civil charges and paying fines totaling $1.7 billion. In 1999, Columbia/HCA changed its name back to HCA, Inc. In 2001, HCA reached a plea agreement with the U.S. government that avoided criminal charges against the company and included $95 million in fines. In late 2002, HCA agreed to pay the U.S. government $631 million, plus interest, and pay $17.5 million to state Medicaid agencies, in addition to $250 million paid up to that point to resolve outstanding Medicare expense claims. In all, civil law suits cost HCA more than $1.7 billion to settle, including more than $500 million paid in 2003 to two whistleblowers. After his forced departure from Columbia/HCA in 1997, Scott launched Richard L. Scott Investments, based in Naples, Florida , which has stakes in health care, manufacturing and technology companies. Solantic, based in in Jacksonville, Florida, was co-founded in 2001 by Scott and Karen Bowling, a former television anchor whom Scott met after Columbia bought what is now Memorial Hospital Jacksonville in 1995. Solantic opened its first urgent care center in 2002. It provides urgent care services, immunizations, physicals, drug screening, and care for injured workers. The corporation attracts patients who do not have insurance, cannot get appointments with their primary care physicians, or do not have primary care physicians. Solantic is intended to be an alternative to the emergency room care that these types of patients often seek, or for not seeing a doctor at all. In 2006, Scott said that his plans for Solantic were to establish a national brand of medical clinics. Solantic has been the target of numerous employment discrimination suits, including one that settled with 7 plaintiffs for an undisclosed sum on May 23, 2007. These suits allegedly stem from a Scott directed policy to not hire elderly or overweight applicants, preferring 'mainstream' candidates. He and his insurance-company friends make millions from the broken system we have now. Some conservative health-care policy experts also questioned Scott's involvement on grounds that Obama's health-care plan had yet to be made public, or on grounds that the insurance industry is willing to consider a compromise which would allow greater government involvement in health care. Other conservative groups have been more welcoming; the director of the Council for Affordable Health Insurance indicated a willingness to work with Scott saying: "He's bringing a lot of money to the table." The group was widely criticized by Nobel Prize winning economist Paul Krugman in the New York Times for pretending to be a grassroots movement of citizens. when in actuality the citizens were bussed in to congressperson's local meetings and the group was being led by Scott. High on the list of the Third Reich's atrocities was its use of state power to undermine the most basic of human rights and the subordination of all other social institutions to the prerogatives of the Party. In "Life In The Hitler Youth" by Jennifer Keeley, the reader learns of the Nazi subversion ofthe family and realizes the disturbing parallels that can be drawn with developments unfolding in our own nation and the Republican family values agenda that includes ideological indoctrination by evangelical churches. According to Keeley, all of German life (including the minutest detail of one's personal life) was brought under Nazi control through the policy of Gleichschaltung or coordination so that all of society and culture reflected National Socialism . As such, the 1936 Law Concerning The Hitler Youth decreed that all of German youth were to be incorporated under the banner of this organization. The Hitler Youth or Hitler Jugend became the source of manpower for the Nazi SS. When reading "Life In The Hitler Youth", one comes away with an uneasiness in the pit of the stomach when one realizes the similarities of the philosophies justifying a number of the programs in Nazi Germany and the United States of America. Although the United States is nothing like Nazi Germany in terms of destroying innocent human lives, if Americans do not now get a grip on certain ideological trends festering below the surface of public policy, the nation could very easily find it self sliding in this kind of downward direction. As Norm Chomsky has pointed out, the US took over the international role of the Germans after World War 2. The US also had a robust fascist movement in it prior to World War 2 called the Bund. Many American corporations were also openly sympathetic to the Nazis prior the the war. In the Nazi and other fascist systems, it is not so much the individual created in the image of God protected by a set of unchanging eternal laws that matters but rather the larger group that counts. For example, the 1936 Law Concerning The Hitler Youth read in part, "The whole of German youth is to be educated,outside the parental home and school, in the Hitler Youth physically, intellectually, and morally in the spirit of National Socialism for service to the nation and community." As evidenced in one of Hitler’s speeches: "learn...that life for you must mean sacrifice, sacrifice of your personal freedom, sacrifice of your free time, sacrifice of many of the small pleasures of life; sacrifices when you take on yourself charges, not for the individual, not for yourself alone...but for your small, and yet so great community." "To teach Hitler Youth the importance of their Volk community, the National Socialists suggested members participate in a form of land service. Although not obligated to do so by any mandate or decree, every year young people ... were expected to help the Volk community...This was designed to teach young people about putting the needs of the community before their own ." The US had similar programs with Herbert Hoover's Civilain Conservation Corps that put many jobless Americans back to work. The objective of such programs --- be they either in a dictatorship or even in a representative democracy --- is ultimately to undermine the loyalty of its participants in regards to other authorities such as family or religion and to replace it with an absolute fealty to the organs of the state. This is similar to GOP 'family values" rhetoric in which conservatives claim to represent the true American way of life. The first phase of this program was innocent enough as it consisted of scheduling so many activities and meetings that the good Nazi family had to take part in that they were basically kept running around, away from one another,and unable to reflect more critically about what they were being lured into. This wasn't really all that much different than what is going on in many of these Emergent and Purpose Driven megachurches these days where activities and meetings are scheduled multiple nights per week and parents are told you are less than an ideal Christian if you only show up for the traditional scheduled Sunday and perhaps Wednesday services. These same techniques are used by both the Mormon church an the Church of Scientology. Those running afoul of National Socialist authorities underwent a process of scrutiny by the social service agencies of that day in a manner those under suspicions other than quantifiable physical abuse. Parents refusing to go along with the Hitler Youth agenda could have their children taken away on the grounds of being "politically unreliable." One might say such parents failed to have their children "properly socialized." Common to all forms of collectivism --- be they the communist, fascistic, or even more democratic and less blatantly homicidal varieties --- is the aspiration to so totally order the existences of those living under these systems. Of course, the Germans believed God was on their side and Hitler may have even wanted to create a new uniquely German religion. The communists were blatantly atheistic early on, bout the Nazis wanted to manipulate religion to benefit the Nazi moment. Keeley writes, "Finally, the Nazis attempted to replace Christianity with National Socialist ideology in the lives of youth. Some National Socialists expressed discontent with the so-called Jewish roots of Christianity...The Nazis began to remove symbols, such as the cross, from schools, but they also painted the Tuetonic crosses on their aircraft and tanks. Fuehrer, my Fuehrer, bequeathed to me by the Lord, protect and preserve me as long as I live. Thou hast rescued Germany from deepest distress. I thank thee for my daily bread. Abideth thou long with me, forsaketh me not, Fuehrer my Fuehrer, my faith and my light. Heil mein Fuehrer . Religion was clearly enmeshed in the Nazi movement and Hitler was clearly obsessed with the occult and religious icons. The Democrats aren't perfect, but what is the alternative? The Republicans really have not offered any alternatives and made the mistake of running against the president in the primary rather than address real issues that are affecting the US. In many conservative campaigns we are hearing that Obama has went to far in health care, but the new health care program is more like a patient bill of rights than a radical program. Americans no longer need to fear losing their insurance because of pre-existing conditions of lifetime benefit caps. A family can now provide a health care umbrella to their children until age 26. What would a Republican Congress really provide? Gridlock, of course, something the GOP has been doing whenever they can get away with it in the Senate. 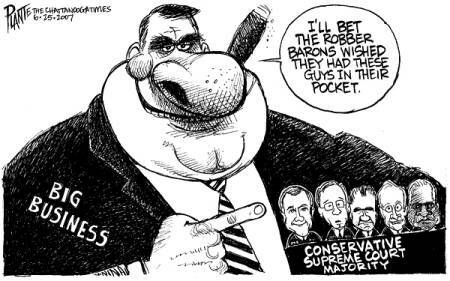 A Republican congress would not crack down on Wall Street and and would leave corporate loopholes in laws whenever they can. They would also try to cut taxes for the most fortunate Americans. The present economic mess the US is in was created by the Republican Party. Bush's job creation record for eight years was abysmal. Why? 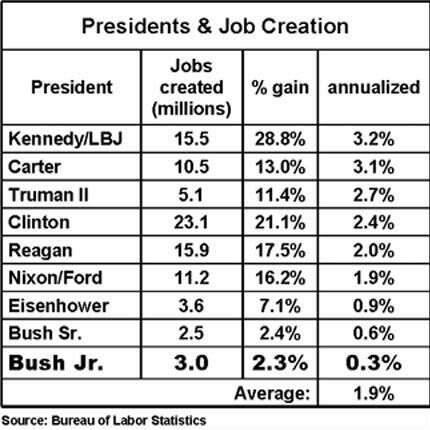 Because Republicans have always been more focused on worker productivity than job creation since worker productivity increases profits. Cracking the whip saves corporations money because they don't have to hire new workers. Rightardia agrees with Politico.com. The GOP failed miserably in the primaries. Part of the problem was they brought out the Tea party activists too early to defeat health care, which was another GOP failure. The GOP peaked too early. they had nothing left in the primaries and willl have even less for the general elections. The Democrats are in the cat bird's seat to capitalize on this GOP blunder in November. We read a brief NewsMax release today suggesting the primaries were a big defeat for Obama because all of the incumbents Obama supported like Arlen Spector were defeated. Traditionally the president, whether Republican or Democrat, will support the incumbents. Rightardia is glad Admiral Joe Sestak defeated Spector. Spector is old and needed to retire. Sestak is an impressive progressive with military credentials. All the evidence pointing to monster Republican House gains this fall—the Scott Brown upset win in Massachusetts, the scary polling numbers in once-safely Democratic districts, the ever-rising number of Democratic seats thought to be in jeopardy—was blown away Tuesday. In the only House race that really mattered to both parties—the special election to replace the late Democratic Rep. John Murtha in Pennsylvania’s 12th District—Republicans failed spectacularly, losing on a level playing field where, in this favorable environment in which they they should have run roughshod over the opposition. Given the resources the GOP poured into the effort to capture the seat and the decisiveness of the defeat, the outcome casts serious doubt on the idea that the Democratic House majority is in jeopardy. It offers comfort to a Democratic Party that is desperately in search of a glimmer of hope. The district itself couldn’t have been more primed for a Republican victory. According to one recent poll, President Barack Obama’s approval rating in the 12th istrict was a dismal 35 percent, compared to 55 percent who disapproved. His health care plan was equally unpopular—just 30 percent of those polled supported it, while 58 percent were in opposition. Some local Republicans have tried to run against Obama in the primary. This strategy did not seem to be effective. House Speaker Nancy Pelosi was even more disliked in the blue-collar, western Pennsylvania-based seat: Just 23 percent viewed her favorably, compared to 63 percent who viewed her unfavorably. Still, Democrat Mark Critz managed to pull off an eight-point victory, 53 percent to 45 percent, over Republican Tim Burns. This is a district that John McCain narrowly won in 200 and the only one in the nation that voted for John Kerry in 2004 and McCain four years later. The race marked the third highly-contested, fair-fight special House election that the GOP has dropped in the last year. The seat Murtha held for 36 years is precisely the sort of Rust Belt district—economically populist and culturally traditional—that Republicans must win to claim the 40 seats necessary to take back the House. Yet the way Critz and the Democratic Congressional Campaign Committee won the contest offered a reminder that the prospect of a GOP majority remains a mirage. And Tuesday’s result has Democrats breathing a sigh of relief, thinking they’ve found a formula to mitigate their losses in what will still be a difficult election season. The playbook from the Pennsylvania special election isn’t complicated: Make the election a choice between two local candidates and not a national referendum on the Democratic Party or the state of the nation; savage the Republican from the outset and don’t let up; keep the focus on jobs and core economic issues; most important, separate yourself from your national party’s policies and politicians as necessary. Sarah's latest media feed? First, her family slips over the Canadian border whenever they needed medical care. Then she recently sated the old conservative bromide that America is a Christian nation. Yet the words, 'God,' 'Christian' and "Jesus' aren't in the US Constitution and the First amendment that is also called the Establishment Clause established the legal doctrine for separation of church and state. Perhaps Sarah should read Article 11 of the Treaty of Tripoli that signed by the founder, John Adams and approved unanimously by the US Senate. Who will win: Nicole Scherzinger or Evan Lysacek? It is too close to call. Nicole may have an advanatage because her partner, Derek Hough (pronounced Huff), is the premier choreographer in the finals. Rightardia doubts if Anna T. can choreograph the final dances well enough to win. If Evan loses, he would be the first Gold Medal Olympian to lose in the finals. Chad Ochocinco and Cheryl Burke should be eliminated tonight. Cheryl is also one of the best choreographers and dancers on the show, but she was dancing in front of Chad last night, a real 'no-no' this late in the competition. We would expect Erin Andrews and Maksim to take the walk after Chad and Cheyrl are eliminated. What would prevent Nicole and Derek from winning? Rightardia expected Derek and his partner to take the mirror ball last year, but Derek went off the deep end with one of his dances and got eliminated. Derek is so good that he sometimes 'hotdogs" and goes over the top with his choreography and gets judge Len upset, a crucial mistake in the finals. If Nicole loses, Derek will likely be responsible. Rightardia got contacted by an excellent web site that explains Swiss tax evasion in living color! Checkout the source! 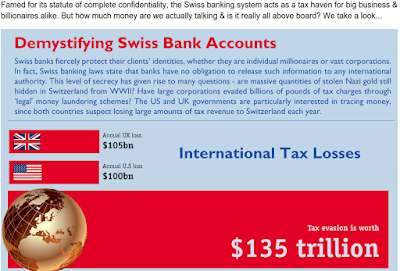 The article untangles the dark mystery within Swiss Banking in the attempt to make it understandable in terms of facts and figures. The article will be beneficial to your readership so Rightardia is featuring it. RT: In court we trust? Rightardia has been banging the corporatism drum for a long time. The GOP has been populated by corporate shills, pimps and whores as long as Rightardia can remember. Prior to the election of Obama, the GOP controlled the presidency for for 20 or 28 years and they filled the vacant Supreme Court positions with hard right idelogues such as Chief Justice John G. Roberts, Antonin G. Scalia, Clarence Thomas and Samuel A. Alito. The Supreme Court has become subordinated to corporate interests. You like to pay twice as much for health insurance as the rest of the world does. You think the rich deserve tax cuts more than the middle class because you miss all of that 'trickle down ' cash. You think the economy will fail because the US is not starting any new wars. You think your family will be better off if Republican politicians, who work for corporations, are in power. You trust the government less than the corporation who laid you off or the bank who tried to foreclose on your sub prime mortgage. You like Sarah Palin and her “drill, baby drill” slogan even though the US just suffered its worst environmental disaster in history in the Gulf of Mexico when A BP oil rig exploded. Although you are unemployed and face foreclosure next month, you think Arizona immigration is a more important issue than the collapse of the US economy and US worker unemployment. You think there may be constitutional issues with a black man being President of the United States. You think 66 weeks is more than enough time for Obama and the federal government to fix the economic train-wreck that the Bush administration created in the previous 8 years.